4 Are LED Desk Lamps Harmful to Eyes? 5 5 Lighting Tips That Can Lead to a Better Eye Health! 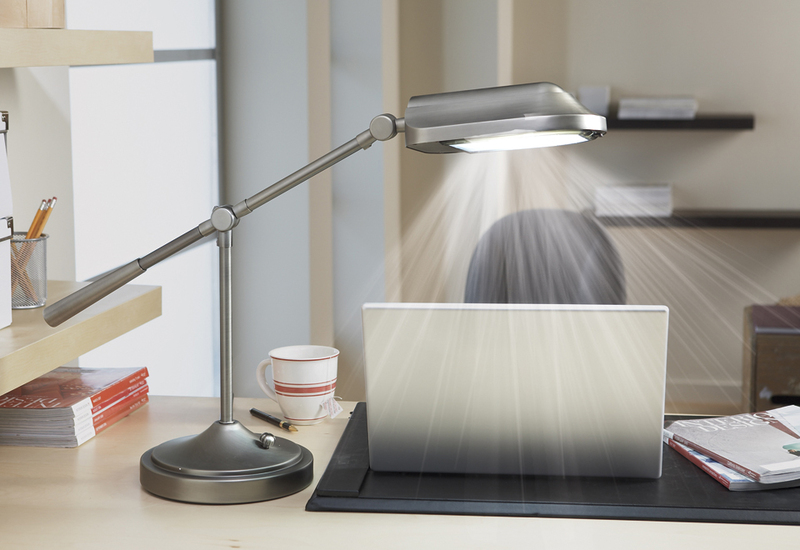 6.1 Desk Lamps Come to Your rescue! 8 Tips for Choosing the Best Desk Lamp for Your Eyes Health? 10 Why is Lighting Important for The Aging Eyes? 10.1 If so, that should be your wake up call. 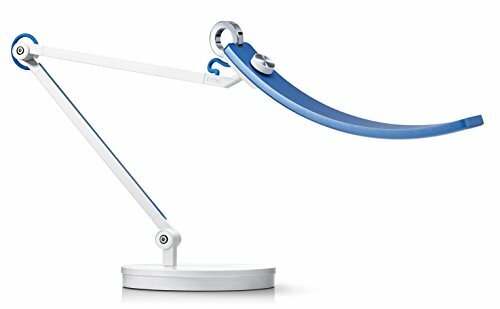 Did you know that Luxo Jr, the mascot of Pixar Animation Studios, is actually a dancing desk lamp? Be it reading a book or working late or simply to have a soothing environment in the room, our last resort is always a desk lamp. And not only that, the desk lamps make our desktops look really cool, don’t they? It is almost as if they reflect our personality on a desk! Desktop lamps have become an indispensible part for not only the voracious readers but almost all of us. But how would you judge which is the best desk lamp that would suit your need? The following article gives you an in-depth answer to all your queries and also the best desktop lamp reviews. 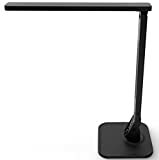 Not only that focuses on the related aspects like buying guide, materials, and most importantly how to select the best desktop lamp that would be suitable for your eyes. Chic would certainly be the other name of this reading lamp. This is a smart desktop lamp with features such as mood lighting and smart lighting; oh yes, you heard that right! The idea behind this stunning creation is to say goodbye to tired eyes forever. 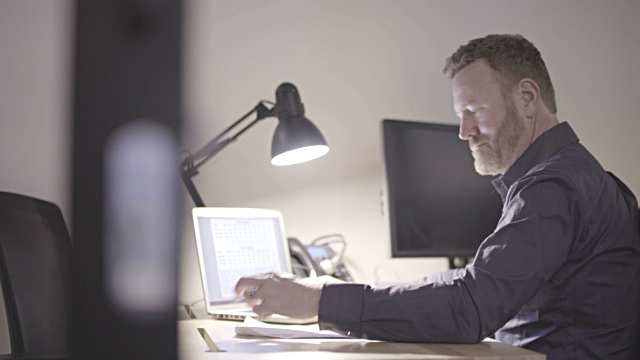 With our generation staring entirely at illuminated screens forever, the lamp is specifically designed to avoid the monstrous glare on the laptop or desktop or even tablet screens which would certainly lead to higher working or reading hours as the eye-muscles remain comparatively relaxed. Customers may just think that the steep pricing of just a desk lamp is outrageous, but then this is not just another desk lamp. The investment is absolutely justified considering how versatile the product is! If painting is what you do, try playing with colors in this soft translucent light. You will soon realize how much of an effort you’re putting on your eyes. And oh, the smooth metal finish! 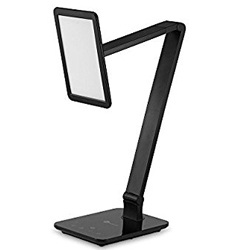 The Stella Lightning Task Lamp is one of the coolest in the market with its ultra-sleek body and next gen look that definitely adds to the aesthetic value of your will working or reading space. The lamp comes with three interchangeable modes to suit the level of lighting you need and you can easily switch from a warm tone to a cooler tone to suit your own purpose. What’s more, you can even dim the specific modes to readjust the intensity of the light at each level. This product has received amazing reviews from the needle-workers who have claimed that the sharp intensity makes sewing an easier job without a flinch of the eye-muscles. This desk lamp is a killer bargain when it comes to its price. Despite its smooth plastic finish (which might be a turn-off for many) this desk lamp does not fail to deliver a stunning appearance. Twist and turn it the way you want to and enjoy an amazingly powerful illumination from this pocket-size powerhouse! You will certainly want to add this uber cool desktop lamp as a decorative piece on your desktop. The weighted base with a counter-balance for the arms of the lamp makes it look like one of those things you picked up from an antique store. This lamp is most suitable for task lighting and would sit perfectly on a wooden top. The bulbs are easily available and the desk lamp comes with dual light options. The tone of the light is warm with a sharp but diffused intensity to make it easier for the eyes to handle. This desk lamp is a sign of your classy personality, of the creative aspects of your life that still relishes the old world charm! Go on, install it on one corner of your space as an ornamental piece. The only problem might be the dual light mode options, but the amazing illumination will surely compensate for it. PS.Surely if you select such a quirky piece in a boutique lamp store, you may have to shell out a fortune! Swing arms will never go out of fashion, we assure you. This lamp has a, wait for it, touch sensitive panel to control the modes. 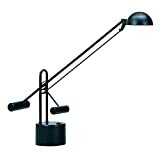 Best for task lighting, the metal finish makes it look sophisticated. Perfect for doing intricate paintings or designs under this light, it would certainly be an eye-catcher if placed on your large office glass-top table. Say goodbye to eye-strains and an uncontrollable electric bill if you choose to own this LED desk lamp. Honestly, we are missing a firm base of the desk lamp here. The clamp looks a bit incomplete with the swing arms for sure. Do not think of settling for this desk lamp for a bedside table or so. Because if your head is not above the lamp, the touchpad is actually not visible. But this can be solved with the toggle-switch though, which can instantly just cut the light, but the dimming cannot be adjusted while sitting on the same level with the desk lamp. Artists, photographers, architects, sewing experts, this is the right desk lamp for you. Maybe the clamp is a visual turn off, but it works wonders on a small desk or a machine where you can just clip it and light it! This is simply desk lamps taken to a different level altogether. 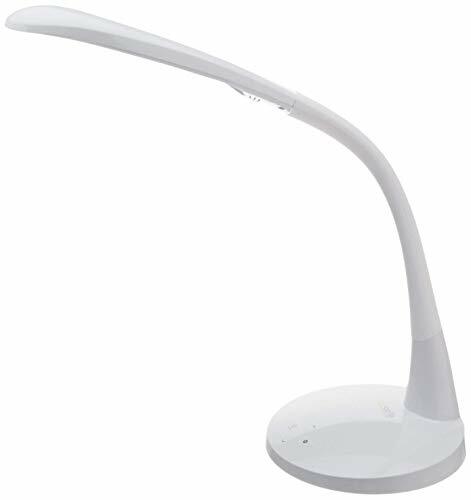 The dual tone changing LED desk lamp comes with a pivoting head that can be twisted to all directions. 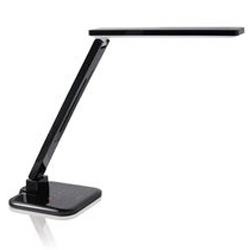 It is extremely pocket-friendly since this LED desk lamp only uses 1 Watt of power at the normal lighting level. The touch sensors at the bottom of the desk lamp lets you control the dimming level smoothly and the really sleep design would work wonders on your work table. Ambient and task lighting, both would work well with this gorgeous black beauty. A USB charging port for cell phones and tablets, this feature is absolutely mind blowing! It is an amazing buy for an entry-level budget. Things cannot get any better than this. This desk lamp is perfectly suitable for study tables or bed-side tables due to its omnidirectional head which would make it easier for the reader or writer to control the way the desk lamp lights up the space. 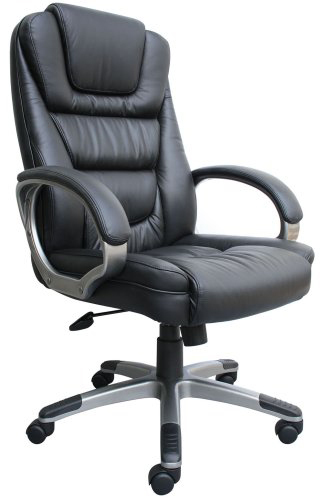 stylish and sleek, this would certainly win your heart at with its meagre pricing but updated features. The first and foremost feature that would attract your eyes is the massive light emitting panel. This desk lamp looks so futuristic that it would certainly complement your home or office space which you have designed to give a minimalistic look. The panel has been designed in such a way that your eye muscles would not be affected as the light would diffuse after being emitted from a larger base which soothes its intensity. Add it to your bedside table, your office worktop or even your reading room at home, this catchy desk lamp will certainly attract admirers. If task lighting is what you are looking for, then this desk lamp would really be beneficial if your space is big. The touch panel is uber sensitive and the options are installed at the base which makes it easier to access from the comfort of a chair or a bed. The lamp would have been perfect if the base was a bit wider because when the arm is extended to the fullest it might have a tendency to trip. But all the other pros just wash away this one small problem, don’t they? A desk lamp at an unbelievably affordable price with 4 lighting modes and 5 level dimmer, could life get any better than this? Cherry on top, this even has a USB port for charging phones, i-pods or tablets. The desk lamp LEDs are blessed with non-flickering technology which will successfully reduce eye-straining and hence effectively help in increasing work hours. Can be used for spot or ambient lighting, this smart desk lamp also has an auto times that cuts the power after prolonged usage. The color changing technology is pretty cool and to be made available in a price tag like this is a miracle. The ample varieties of dimming options are also an impressive feature which will let you enjoy the light in accordance to your mood. Budget friendly for young adult and students, this will grace your study or work table perfectly, be it a glass or wooden top. Talking about pocket-friendly desk lamps, the LAMPAT desk lamps are perfect for the souls whose desk lamps need to be replaced in the middle of the semester. 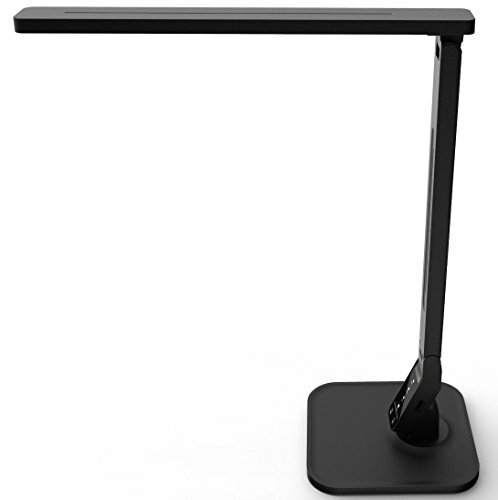 Coming with a USB port to help you charge the dying phone or iPod, this extra sleek LED desk lamp is perfect to tackle the space crunch. Be it on a table full of books or a small corner of your room, the light will, of course, portray your heightened taste. 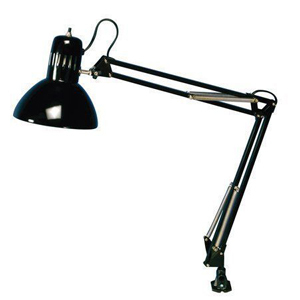 This lamp is great for people who perform detailed tasks like architectural drawing and sewing. The lamp lets you operate the hue and intensity which is extremely helpful at a time when you just want to relax on a dim light. 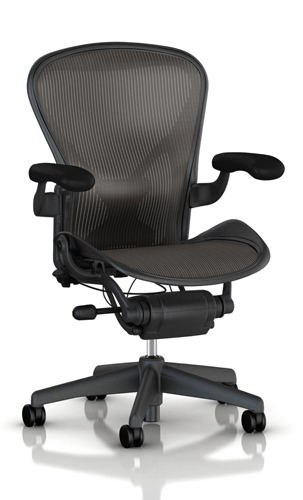 The sleek design can sit comfortably on any surface but again the arm-base ratio gets disturbed when the arm is extended to the fullest. You just don’t want a bad trip, do you? An attractive desk lamp which can suit any purpose, be it task lighting or ambient lighting, with its eco-friendly long lasting and bright LED. 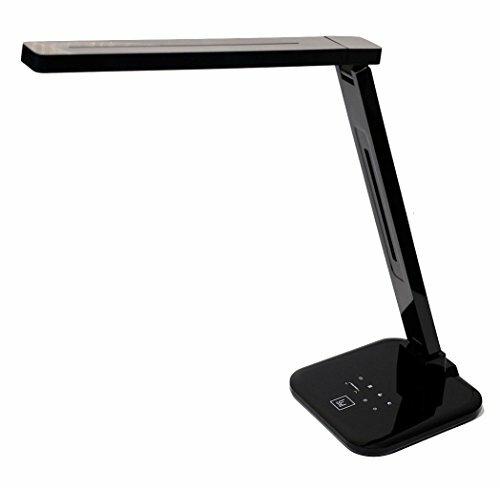 The smart LED desk lamp also has a USB port for the smartphones of the smart generation. Worry not about the price as it will even be enjoyable for someone with an entry level budget and also an effective buy for someone who is in the mood to splurge. The four modes of illumination are highly effective is highly effective in keeping up with the mood of the user. The only con is perhaps the fact that the light strip is fixed which kind of, constraints its power for a generic illumination and sometimes it may be too bright for your eyes. It is extremely detailed and the glossy finish makes it look gorgeous when placed on the corner table at work or at home. A stained glass top would be perfect to let this sit on. The lamp shade can also be customized to stained glass pieces which are used to ornament darker parts of the room, may be accompanied by a small indoor plant by it. Banker’s lamp is an old-world charmer. The reason why it came with a green lamp shade was that it was believed that green was the color which would induce an air of creativity all around. That is why these were installed at art galleries, music, and dance halls so that the performers could be under the influential aura of the light. The intricate designs on the base of the lampstand not only beautify the space but also reflect the heightened taste of the buyer. A banker’s desk lamp should be chosen by a buyer if space where it is to be installed has an antique or colonial touch to it, of not a creative sphere. The clamp-on desk lamps are nothing but a modern rendition of the desk lamp in the most portable fashion. These desk lamps, as the name suggests, can be attached to books, tablets, kindles and laptop skins. The light is sharp and is effective for detailed works. These kind of desk lamps are perfect for smaller desks. Also, these are very popular with people who are into professions such as architecture or sewing since the sharp light is extremely effective for minute detailing yet it does not hurt the eye muscles or strain them in anyway. 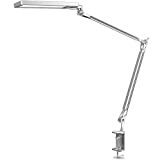 Mostly used by technical professions and kindle users, the clamp-on desk lamps are perfect to save that space crunch and also in shared rooms or hostels where a big desk lamp might cause a problem for the other individual. 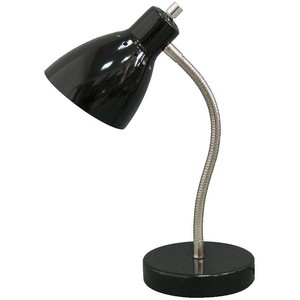 The gooseneck desk lamps are immensely popular as decorative pieces of larger desks. The lamps are attached to flexible lamp stands or shafts. This arrangement allows the user to twist the source of illumination in anyway needed without moving the object that needs to be illuminated. 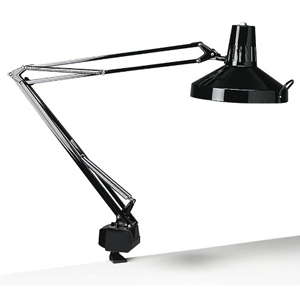 The gooseneck desk lamps are mainly used in places like factories, art conservatories, architecture firms, and so on. The lamps do not have a fixed desk base at times and are installed on walls even. 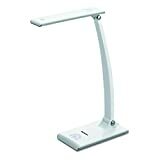 The gooseneck desk lamps are also used as bedside lamps at times, to make bedside tables look more elegant and of course as they provide the proper illumination for activities such as reading a book before hitting the bed. The curvy design comes with a potential of powerful illumination and adds a touch of elegance in a small or a large space. The gooseneck desk lamps sit perfectly on polished wood or glass and provide ease of access to the users. The gooseneck lamps can be a clip on or come with a heavy base. These are nothing but bulbs that are attached to the end of one or multiple swing arms which are balanced on the middle or at the end. 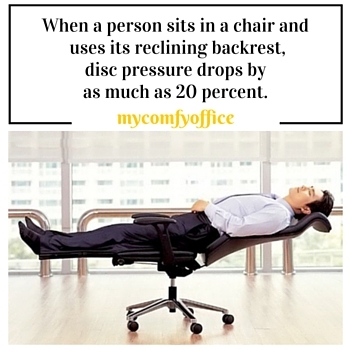 The impressive design will surely add to the oomph factor of your desk. Ranging from tall or moderate height, the bulbs are easily changeable and mainly come with dual bulb options. Ambiance or mood lighting settings are generally not found in swing arm desk lamps. The sophisticated designs make it suitable for installation at any kind of space but preferably larger spaces would benefit from its impressive design. This lamp can be bought as an all-purpose desk lamp, but it would not what would sit perfectly on a bedside table or a small round table. This lamp needs a proper desk and a bit of space to operate. 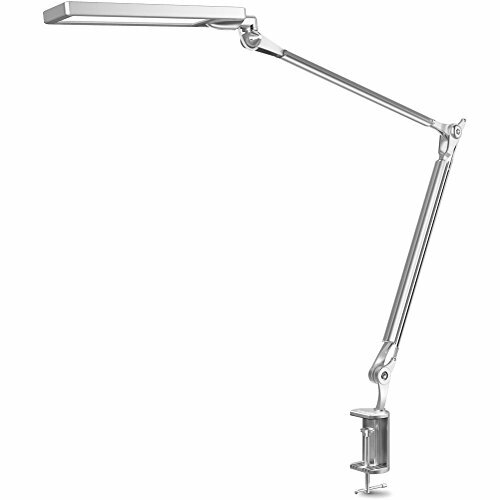 Swing arm desk lamps are not necessarily portable in nature and are generally mounted on a surface permanently. Also, these cannot be mounted on a vertical surface but needs a horizontal base always. What else should you consider? While selecting a perfect desk lamp, you should also concentrate on the height of the desk lamp as it will determine whether you are buying the lamp for accent lighting, ambient lighting or simply as a decorative item or specific task lighting like writing, studying or designing The colors of the desk lamps should be coordinated with the colors of the walls and also the material and the finish should match with hat of the entire desk arrangement. If it is for the kid’s room, then a clamp on with vivid colors should be enough to motivate the young mind to paint or sit with a book and finish the not-so-exciting homework. Why should you pay so much importance on just a desk lamp? Light can change the mood and tone of any situation and hence it is very important to think and invest on desk lamps and those would be an important part of our lives. Various DIY desk lamp designing are also available nowadays which would give you a perfect idea about the placement of each and every lamp.The best desk lamps will not only save your eyes, but also save you from an array of adverse situations such as fatigue, high pressure, and headache. Hence it is very important that before shelling out a lump-sum amount on any desk lamp, the need is understood. It is okay if you are at the comfort of your home, but for people who work at small spaces such as tiny cubicles or dark rooms and lockers, the only source of light is perhaps a desk lamp. Hence essentially only the best desktop lamps should be chosen and invested on to avoid any permanent damage to the eyes and have a life that is illuminated to perfection. So, who would have thought so much of effort goes into what you thought was, “just buying a desk lamp?” Did you even imagine? We cannot live without sweets and savouries, but too much of sugar is of course not good for our health. Similarly, too much exposure to LED is not good for our eyes, but a normal balanced exposure should not cause any permanent damage to our eyes. Let’s know how! The LEDs and CFLs produce a kind of blue light, which is responsible for the regulation of the circadian rhythm of our body, the constant exposure to which may permanently damage our eyesight. Energy and money will, of course, be saved by LED installation, but you should also be careful about your own health. As they say, a little bit of everything doesn’t hurt, but too much of anything turns out to be pretty bad. 5 Lighting Tips That Can Lead to a Better Eye Health! No. 2 is so easy but you never have done it for sure. Natural light: Set up your table at home in spots where natural light is abundant. Reading, writing or working at a space, where there is great natural light, keeps your eye muscles soothed. If it is a reading room, ditch the idea that you have to decorate the space with a library-like feeling but keep it light and airy, where the sunlight can make your face shine. Light regulation: Just like you have regulators for fans and air conditioners, install light regulating systems. Though it might be a little hefty on the pocket, but the entire lighting system of your homes will be on your grip. What more? You can adjust the brightness, intensity, and hue of the lights, which will help you relax your eye muscles. Sit in the sofa with your beloved book and coffee and have a warm tone to simply relax your eyes as you smoothly glide through one page after another. Separate intensity: You can use different intensities of lights at different zones to help your eyes adjust faster to the light that is required. For example, you do not need a very powerful light on your closet, but you do need a proper lighting system on your desk. So you can use different kinds of lights to help the eyes in adjusting to the temperament of the light that is perfect for the specific zones. But don’t zone out just yet! If the desk where you work is large and the activity is light in nature, like story book reading or pencil sketching, go for ambient lighting rather than task lighting. Task lighting can at times tax the eye muscles too much and it may effect the overall health of the eyes after a prolonged exposure. And last but not the least, Overhead lights: Use overhead lights as much as possible in the spaces like kitchens and common floors so that our eyes do not even meet the light emitting panel in any way. The LEDs in overhead lighting are at a larger distance than that of desk lamps which is a boon in disguise. Desk Lamps Come to Your rescue! Not only for little kids but even for adults, concentration and focus is influenced by nothing other than the lighting system near the study table. So, here are some tips to set up the best lighting system near your study table. The direct source of light should be kept away from eyes as much as possible. Even while using desk lamps for dedicated reading, the LED should not come at a level where you can directly stare at it. The intensity of the light should not be extremely sharp but the hue should not be sleepy and dull either. Abundant use of sunlight whenever possible. Shadows should not fall on your study table, so if the lighting is overhead, it should be positioned properly. There should be ample space for the sunlight to play around in the room. LED and CFL lighting should be used for a more economically beneficial return in the long run. 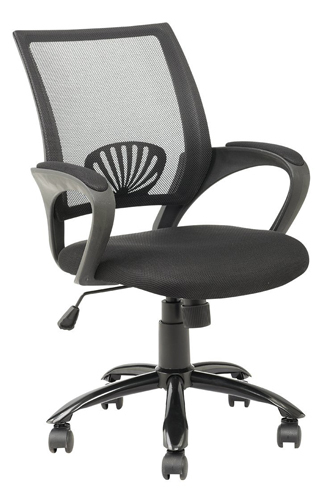 Each table or cubicle should be provided with a dedicated desk lamp. Overhead lighting should be used as much as possible and regulators should be installed as well. The home or workplace mood can be uplifted from slow to super fast with the turn of the switch, so install mood lighting and notice the difference. Be it an office party or a cosy gets together at home, mood lighting always works its charm. Use trendy shades to dress up spaces like racks and closets. Select your lights in coordination with your walls, curtains and of course the theme with which you want to experiment! Just pick the coolest lampshades and throw in some jazz. Let the light illuminate your life! 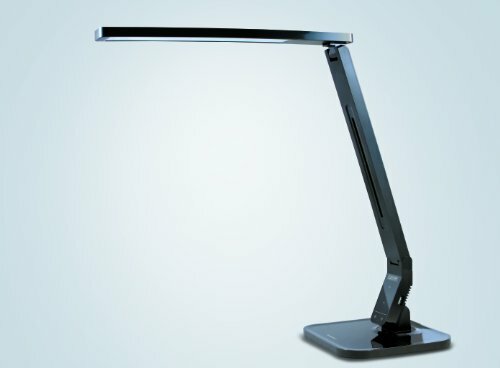 Tips for Choosing the Best Desk Lamp for Your Eyes Health? While selecting desk lamps you should be extremely picky. 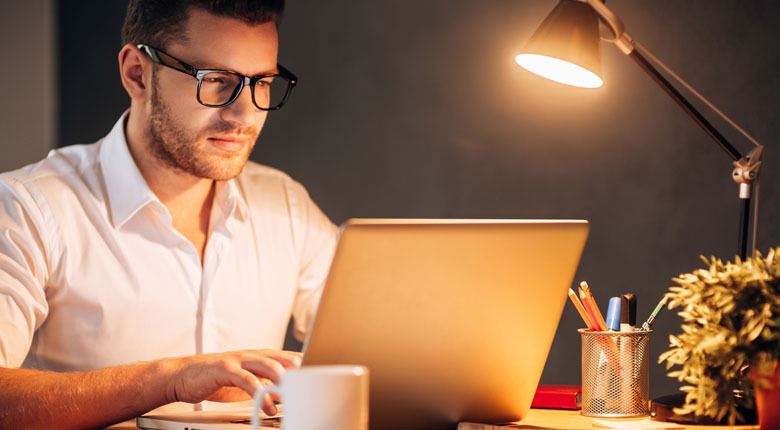 Yes, as difficult as it may sound, but optimal eye health is necessary and all the desk lamps certainly do not provide the best features, which will help you protect those tired eye muscles. Re-check if the following features are available on your desk lamp. Else, change is the only constant, you know it! Why is Lighting Important for The Aging Eyes? With each passing day, our eye muscles are losing their precision thanks to the constant exposure to the light emitting screens. For the aging eyes, lighting is very important since the vision is getting blurrier as our eyes age. For people, who have reached a certain amount of age, proper and crisp lighting is important for them to understand the physical dimensions and aspects of an object. So, a simple overhead light might not work for the aging eyes, but task lighting would certainly be fair when it comes to activities like reading, writing or painting. After a tired day at college and work, when you sink into the sofa, do you feel things are getting blurry even for a fraction of a second? If so, that should be your wake up call. Take care of your eyes! Use proper lighting as it is a sign that your eye muscles are sore and they are malfunctioning. Use the best desk lamps that we have suggested and let the worry about your eye-health jump out of the window. Desk lamp reviews explain the most important things to know when shopping for the right one for your needs. Amazing. The Lumiy Lightblade is my fav! Great list. Thanks. I’m really loving the Lumiy Lightblade 1500S LED desk lamp. That lamp is massively bright!